Cars –- they aren't just for Earth anymore! Proving that America still has mad space exploration skills, NASA sent a highly advanced roving vehicle to Mars last week to research conditions on the Red Planet. But while the Curiosity has gotten a great deal of attention in the news lately, it isn't the first time we've sent a car-like vehicle to another world. 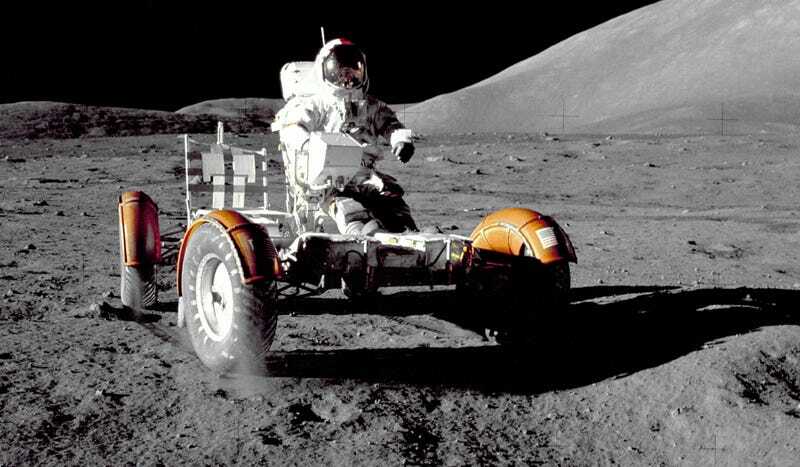 Ground vehicles have been a vital part of the space program since its inception, whether they were driven by astronauts on the moon or automated rovers sent to Mars. While they often include state-of-the-art equipment and are built for extreme conditions, they have quite a bit in common with the ordinary Earth vehicles we drive every day. Check out the gallery above to see some of NASA's past, present and planned space-mobile efforts. What is it: While the Soviets put a rover on the surface of the moon before the U.S. did, NASA put the first man-operated vehicle on the surface of the moon in the form of the Lunar Roving Vehicle in 1971. The vehicles were used in the last three Apollo missions, 15, 16 and 17. The "moon buggies" deployed out of the lunar module using a system of pulleys and ropes, if you can believe it. Two non-rechargeable zinc batteries sent one-fourth of a horsepower to all each wheel, and the whole thing only weighed about 460 pounds. The vehicles were pretty primitive by today's standards, but they proved pretty reliable during each mission. Besides, each rover only traveled about 30 kilometers on the moon. Cost: $38 million for four rovers, according to NASA. That's in 1971 dollars — solving for inflation means they would cost more than $200 million today. What real car it's most like: Open top, two seats, four-wheel-drive? A Jeep Wrangler, obviously. Just one that drives on the moon. What is it: When we put the lunar rover on the moon, it only ran for a couple hours. That's not the goal with the Space Exploration Vehicle concept, which has been undergoing testing for the past few years. This vehicle is designed for long-term space exploration. NASA sums it up well: "The surface SEV is designed to require little or no maintenance, be able to travel thousands of miles climbing over rocks and up 40 degree slopes during its ten year life exploring the harsh surface of the moon." In addition to packing a cabin that can sustain astronauts without space suits, wheels that can turn sideways and a special grappling arm, the prototype has some conventional features as well. It has a rechargeable lithium ion battery, which NASA says it will need to be able to run for 500 miles without needing more power. Cost: Budgeted at $153 million in 2010. What real car it's most like: A Winnebago with the engine of a Nissan Leaf. What is it: Designed to be "cheaper, faster and better" than the Viking probes sent to Mars in the 1970s, the Pathfinder was the first robotic rover NASA sent to the Red Planet. Pathfinder consisted of a lander and a small rover called Sojourner. It touched down in July 1997, assisted by a parachute and airbags to cushion its landing. The tiny six-wheeled vehicle spent about three months transmitting tens of thousands of images from the planet, as well as data on soil and weather. NASA says that thanks to Pathfinder, we know that Mars may have had liquid water and a thicker atmosphere at one point. Check out the Pathfinder's fabulously late-90s website here. There's an all text version of the site if your browser can't handle images. What real car it's most like: A Nissan Pathfinder. Kidding! Totally kidding. No, at about the size of a milk crate and weighing only 25 pounds, like Sojourner is awfully similar to an RC toy car. What are they: Twin roving "robot geologists" called Spirit and Opportunity sent to Mars in January 2004. The two rovers were dispatched to opposite sides of the planet that may have been affected by liquid water sometime in the past. The rovers took panoramic photos and soil samples over a fairly decent swath of the planet. NASA said Opportunity covered about 21 miles, but Spirit wasn't so fortunate — that rover got stuck in a sand trap. The rovers themselves were quite a bit bigger than their predecessor. About the size of a golf cart, they weighed 365 pounds and were essentially six-wheeled mobile computers with powerful cameras mounted up top. Cost: Building, launching, landing and operating the rovers for their original 90-day mission cost $820 million, according to the BBC. They've had several mission extensions since then for an additional cost of about $120 million. What real car they're most like: They're automated and have a big camera on top, so I'm thinking they're not unlike Google's driverless and camera cars. Spirit even got stuck just like one recent Google Earth car in India. What is it: This is IT, ladies and gentleman. The biggest, baddest rover we've ever sent to Mars, the one you've all been reading about for weeks. Curiosity landed on Mars on August 5 and will be active for at least one Martian year, which is about 23 months. It will explore the planet with greater range than ever before and carry the most scientific gear ever deployed to the planet's surface. It's got an even bigger mission, too: to find out "whether conditions have been favorable for microbial life and for preserving clues in the rocks about possible past life." At 10 feet long, 9 feet wide and 7 feet tall, NASA says it's about the size of a small SUV — albeit a light one at 2,000 pounds. It runs on nuclear power, has six wheels, and packs a ton of laboratory equipment including a powerful drill and a freakin' laser beam that could slice your arm off. Read more on why Curiosity is awesome at Gizmodo. What real car it's most like: Huh, this is a tough one. Imagine a first-generation Miata that's been built into an SUV given six wheels, a laser beam, a nuclear reactor for an engine, and a computer brain that drives it. That's the closest metaphor I'm clever enough to come up with.